I recently read an article on a study that was done in 2012 and published this year in Clinical and Experimental Rheumatology online, entitled “Low-field MRI versus ultrasound: which is more sensitive in detecting inflammation and bone damage in MCP and MTP joints in mild or moderate rheumatoid arthritis?” (W. Schmidt, B. Schicke, B. Ostendorf, A. Scherer, A. Krause, M. Walther). The study concluded that “MRI of the dominant hand and bilateral ultrasound of metacarpophalangeal and metatarsophalangeal (MTP) joints are superior to X-ray to detect erosive disease in mild and moderate rheumatoid arthritis. MRI is slightly, but significantly more sensitive than ultrasound for erosive disease, while ultrasound is more sensitive to detect tenosynovitis.” Ultrasound and MRI are comparably sensitive to detect synovitis. It made me question, once again, if I was under-utilizing diagnostic ultrasound. I do not think I use it enough for forefoot pathology. A 52-year-old female patient has a 6-month history of sub 5 pain. There is no history of trauma. The pain is 4/10, when it is present. Pain is worse with standing or ambulating for long periods of time. There is no swelling and pain is described as “pressure and aching.” The patient is not diabetic and other than hypothyroidism (controlled), she is healthy. The clinical exam was unremarkable except for mild tenderness sub 5. There was no swelling and overlying skin was normal. There was no pain with dorsiflexion (DF) or plantarflexion of the digit. X-rays were unremarkable. 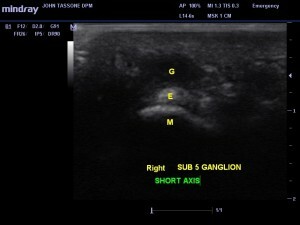 Ultrasound of the plantar 5th MTP joint revealed a hypoechoic mass superficial to the extensor tendon of the 5th MTP joint. This was best appreciated on the short axis (see Image 1). Image 1. G, ganglion; E, oval extensor digitorum longus tendon; M, metatarsal head. A 49-year-old female presents with sub 2 pain. The pain has been present off and on for over a year. It started when she began working out and using the treadmill. She has since stopped that activity. With increased activity, the pain can reach a 7/10. Rest helps and so do certain shoes. Sometimes it feels like she is walking on a “wad of tissue.” The patient has hypertension (HTN), hyperlipidemia, and back problems. 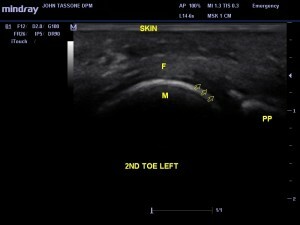 A clinical exam revealed pain sub 2 with a slightly contracted 2nd toe. There is no pain in the interspace. There was a positive Lachman’s maneuver, but no pain with DF of the toe. The remainder of the exam was unremarkable (see Image 2). Image 2. 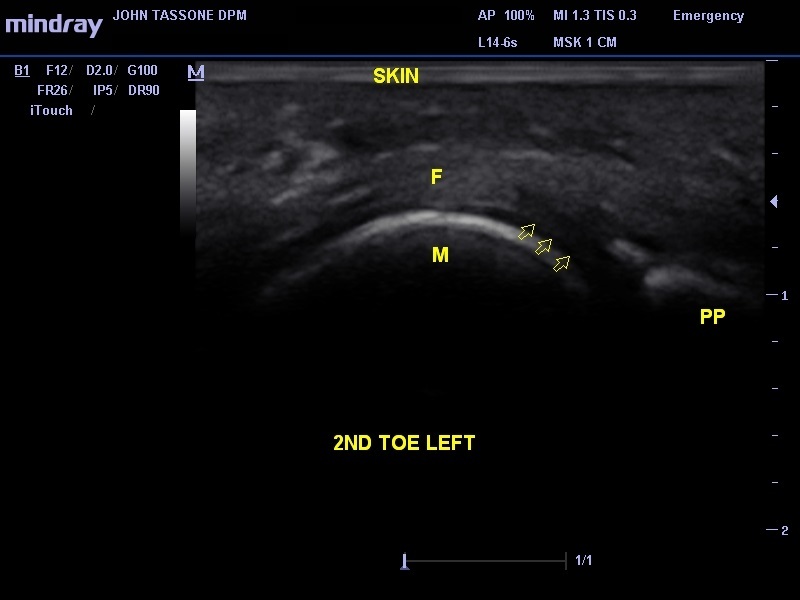 Longitudinal view, which reveals (at arrows) the hypoechoic abnormal plantar plate. M, metatarsal head; PP, proximal phalanx; F, flexor tendon. A 57-year-old female patient presents with sub 1 pain for 3 months. There was no inciting event. The pain is worse with activity and better with rest. She has good days and bad experiences pain when she pushes off with her forefoot. She does not have history of swelling. The patient is a well controlled type 2 diabetic with mild HTN. The exam revealed pain with DF of the hallux. Pain is noted sub 1 on the tibial and fibular sesamoids. There is no swelling and no dorsal joint pain. X-rays are unremarkable and neurological and vascular exams are normal (see Image 3). Image 3. Short axis scan sub 1. 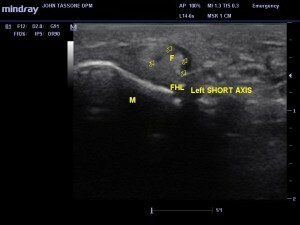 M, metatarsal head; F, flexor hallucis longus; multiple arrows, swelling in sheath; single arrow, abnormal hypoechoic area within the tendon (possible tear?). The diagnosis is flexor hallucis longus tendonitis and a possible tear. 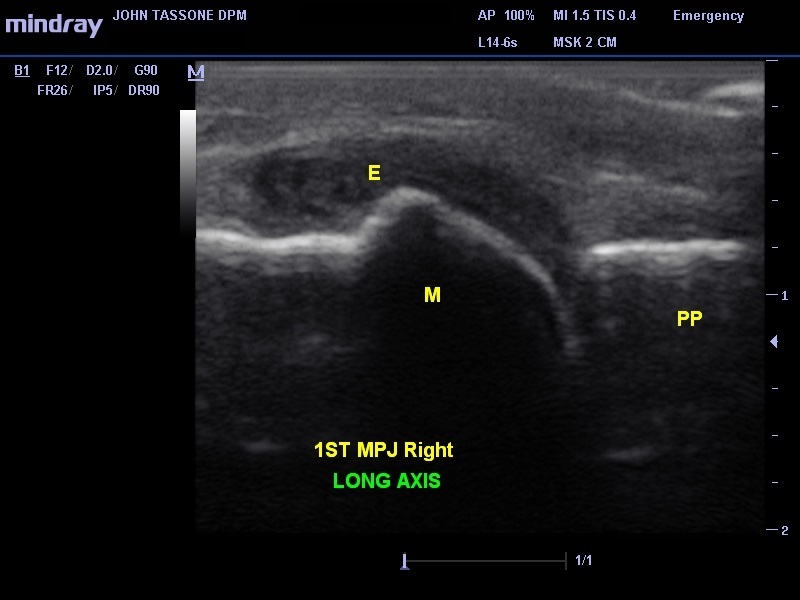 A 56-year-old female presents with pain in the first MTP joint. The problem has been present for 4 weeks. Since making her appointment, she is a little better. Pain is worse with exercise. She walks the treadmill for half an hour, 4 times per week. When the pain started she took 2 weeks off, but now is back to walking 4 times per week. After exercising, she has so much pain the next day she has to take 400 mg of Advil 3 times per day. She has tried different shoes and the better support has helped. She has osteopenia and takes calcium supplementation. She also is on estrogen replacement therapy. The clinical exam revealed pain in the dorsal joint. There is no redness or warmth. Mild crepitus is noted but the patient had 65 degrees DF available. There is no dorsal spurring when palpated. End range of motion is slightly uncomfortable. The rest of the exam and X-rays were unremarkable. 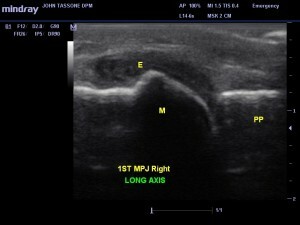 Ultrasound reveals hypoechoic swelling and synovial thickening of the dorsal first MTP joint (see Image 4). Image 4. Long axis of the joint. M, metatarsal head; E, effusion; PP, proximal phalanx. 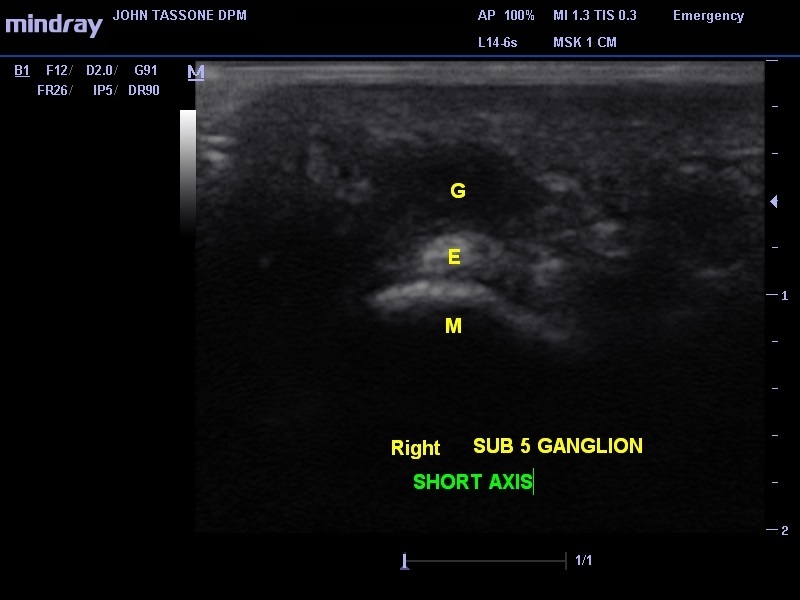 Musculoskeletal ultrasound–a state of the art review in rheumatology. Part 2: Clinical indications for musculoskeletal ultrasound in rheumatology. Kane D, Grassi W, Sturrock R, Balint PV. 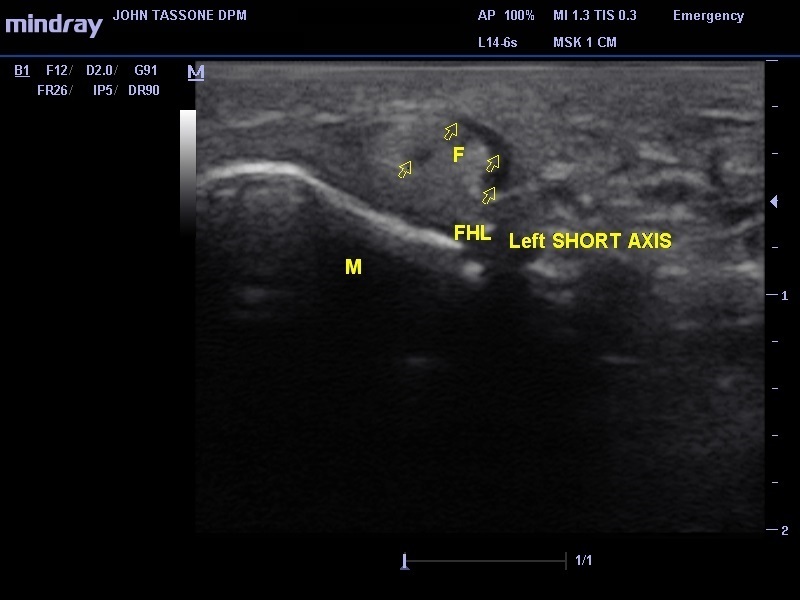 Ultrasound of the hands and feet for rheumatological disorders: influence on clinical diagnostic confidence and patient management. Matsos M, Harish S, Zia P, et al. Why aren’t we all doing ultrasound? Musculoskeletal ultrasound including definitions for ultrasonographic pathology. Wakefield RJ, Balint PV, Szkudlarek M, et al. The Journal of rheumatology 2005;32(12):2485-7. Prospective two year follow up study comparing novel and conventional imaging procedures in patients with arthritic finger joints. Backhaus M, Burmester GR, Sandrock D, et al. Annals of the rheumatic diseases 2002;61(10):895-904. Wakefield RJ, Gibbon WW, Conaghan PG, et al.